I have no idea how to write this stupid book. Can I just be honest with you for one second? This is the literal truth. "Greg Gaines is the last master of high school espionage, able to disappear at will into any social environment. He has only one friend, Earl, and together they spend their time making movies, their own incomprehensible versions of Coppola and Herzog cult classics. Until Greg’s mother forces him to rekindle his childhood friendship with Rachel. Rachel has been diagnosed with leukemia—-cue extreme adolescent awkwardness—-but a parental mandate has been issued and must be obeyed. When Rachel stops treatment, Greg and Earl decide the thing to do is to make a film for her, which turns into the Worst Film Ever Made and becomes a turning point in each of their lives. And all at once Greg must abandon invisibility and stand in the spotlight." This summary fails to mention how hilarious this book is. Literally every page has something funny on it. Most of the humor is kind of low-brow, but I was literally laughing out loud as I was reading the book, something I haven't done in a while. It was great, although kind of awkward because I was reading in a place with other people. I read this book in two sittings, and definitely could have read it in one. Some of the profanity in the book was a bit disturbing, but it was also really amusing, as were some of Greg's descriptions of his life and sense of humor. Both Greg and Earl are actually fairly smart people despite their oddities, jokes and swearing. Greg views life with such a cynical lens; indeed, in one of the flashback scenes he and Earl start calling themselves nihilists (although cynicism and nihilism are not exactly the same things). The humor was unexpected, and I just loved it. I didn't have much of a notion of what the book would be like going on and I just loved its hilarity. Despite the fact that the book has a dying girl in it, it's just so funny and entertaining, and really insightful too, despite Greg's repeated warnings that the book will not contain any "Important Life Lessons, or Little-Known Facts About Love, or sappy tear-jerking moments When We Knew We had Left Our Childhood Behind For Good, or whatever." He adds that "things are in no way more meaningful because I got to know Rachel before she died. If anything, things are less meaningful." Yeah right. There's definitely some meaning in this book despite Greg's assurances to the contrary. Me and Earl and the Dying Girl does stay away from cliches though, which is good. I liked that the main film that inspires Greg and Earl is an actual movie, one of Werner Herzog's. I haven't seen this particular one (Aguirre, the Wrath of God), but I have seen some of his other films and documentaries, and they're...interesting. The documentaries tend to be a bit heavy-handed. However, quite often authors use fake books and movies as part of their characters' world, and I was happy to find it not so here. Some of the descriptions of the films Greg and Earl make were just hilarious. Most of them are terrible, but the way Earl describes them had me laughing. Their film-making career started at an early age after watching the aforementioned Werner Herzog movie. 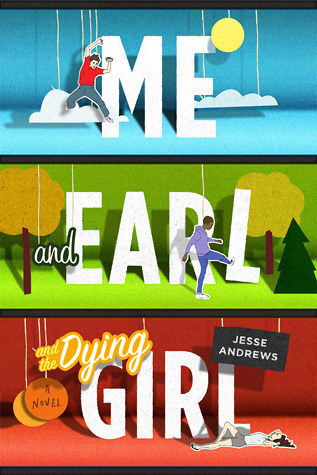 Me and Earl and the Dying Girl was just laugh-out loud funny, but it also certainly had its sad moments, although it's of course not nearly as good or heartbreaking as say, The Fault in Our Stars. However, I enjoyed the plot, the writing, and the narration.